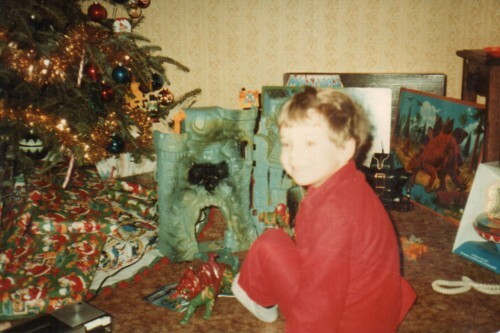 I came across this photo of me from Christmas, either 1983 or 1984 (I think ’84). Castle Grayskull was obviously the big gift that year, as my huge grin shows. 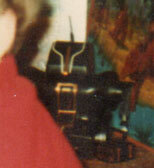 But then I noticed something in the back and, being the obsessed person I am, I have to know what it is. Anyone recognize this robot? It looks like it might be radio-controlled, which is odd, since I generally disliked R/C stuff. Though maybe this was the toy that made me realize I didn’t like R/C toys. UPDATE: And we already have our answer – it’s Tobor! That robot is Tobor, yeah robot spelled backwards. I had one. It came with a clicker that caused the toy to alternate between moving in a straight line and turning right. No left turns for this robot. So, this was the Derek Zoolander of toy robots? Looks like Man-At-Arms & Beast Man are in a serious scrap! I've got a Tobor in my parents' attic. Last time I checked, he'd lost part of an arm. I wonder if he still works.